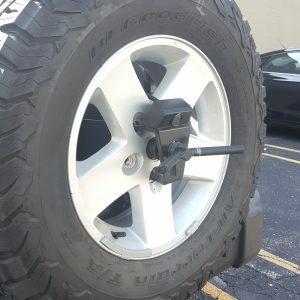 The SummitView™ Oversized Tire Carrier Camera is for all those off-road enthusiasts who have the Smittybilt Oversize Tire Mount (part number: 2743) or similar aftermarket tire mount. Brandmotion’s innovative Jeep Wrangler Rear Vision System line gives your shop the edge in offering backup protection that’s not available anywhere else. This kit is designed for vehicles with an aftermarket display, such as an aftermarket navigation radio or other display monitors. (Or, add our 9002-6115 Jeep factory display flash programmer for easy factory display integration). The camera is a Sony Infrared camera with CCD technology for superior daytime image crispness & nighttime brightness for seeing clear and far into the dark. Don’t have a Tire Carrier yet? Smittybilt’s Oversized Tire Carrier is the most economical way to mount an oversized tire onto your 2007-2018 JK Wrangler. It attaches to the factory tailgate using the existing holes and requires no drilling or modifications. Completely adjustable and designed to mount up to a 37″ tire or up to 195 lbs. Carrier and tailgate open and close as a single unit. This entry was posted in Uncategorized on December 21, 2017 by Hollie Prater.